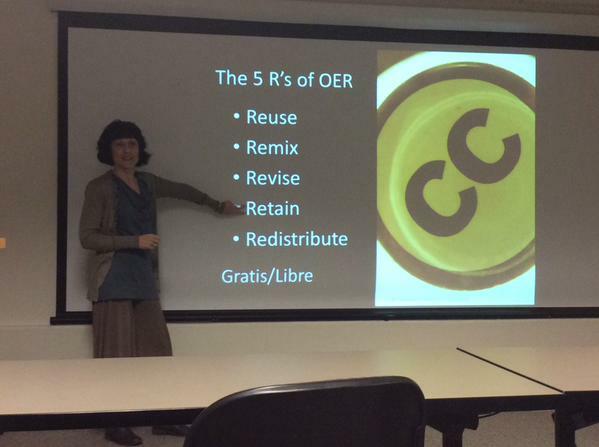 The University of New Hampshire recently launched an OER Ambassador Pilot Programme. It’s an interesting model of faculty-driven OER development of UNH courses or modules with the main goal to maximize student learning outcomes while reducing or eliminating the cost of instructional materials. UNH OER Ambassadors will be expected to perform the required work during Summer 2015 in close collaboration with a team of faculty/staff from the Library and UNH IT Academic Technology and with the support of OER Pilot Consultant, Robin DeRosa. I have been intrigued by the pilot programme since its inception and was thrilled to read Robin’s blog post about the pilot kick off. Her blog post outlined the kick off events, but I wanted to know more and fortunately Robin was available for a short interview to further explain the details of the pilot programme. Q: The pilot programme places great emphasis on Open Pedagogy and Open Educational Practices. How have you educated the faculty in your pilot on Open Pedagogy and Open Educational Practices? A: Our first training session did a nice job of laying out our emphasis, I think. It was basically a three-tiered session. The first tier (primarily handled by our Academic Technology leaders and Mary Lou Forward from the Open Education Consortium) focused on inspiring our Ambassadors to lead, and on the importance to students of the work they were about to embark on. The second tier focused on open pedagogy, firmly situating OER into a broader conversation about our role as teachers. The third tier was a nuts-and-bolts team session where participants could get customized help setting their summer plan from librarians and instructional designers. But the longest slice of time we had together as a group was squarely focused on open pedagogy. I basically explained how OER leads us to think about knowledge and knowledge transmission in a new, more dialogic way. From there, I went through every aspect of a conventional syllabus (learning outcomes, required texts, schedule of work, assignments, and grading procedures) and we explored possibilities for “opening” each section. I offered provocations from key thinkers in related fields (like critical digital pedagogy, digital humanities, and rhizomatic learning) and covered examples of open pedagogy in action by highlighting successful projects and syllabi from professors in diverse disciplines. By opening our OER pilot with a commitment to talking about open pedagogy, we really tried to highlight that cost-savings is only the beginning of the success we could have as we convert our materials to OER. Q: In your blog post (http://www.unh.edu/it/news/2015/06/oer-pilot-kickoff#.VYQnhDbzogw.twitter) you state that part of the $3000 stipend is for faculty to think about open pedagogy- how are you encouraging the faculty to develop Open Pedagogy activities and assignments? have a trained support team who is invested in and knowledgeable about open pedagogy and OER. I think I covered the first one in my answer above, but let me just elaborate on the other two for a moment. I think it’s crucial for faculty to understand “open” in the three main ways that it can function in our world, and I loosely think of these three ways as parallel to trinity of our profession: service, teaching, and scholarship. In terms of service, I think of OER, and how we can save students money, decrease their debt-load, and increase access to affordable education. In terms of teaching, I think of open pedagogy. And in terms of scholarship, I think of open access. When we talk to faculty about OER, I think we really want them to see that it’s part of a broader vision for higher education that can provide a sense of coherence across all of the aspects of our professional lives. That being said, OER and open access are both fairly concrete ideas that can be introduced in a pretty straightforward way. But open pedagogy is a dynamic and emerging field, and it can be more challenging both to define it and to provide examples of its practice. I worked hard to offer a clear, well-theorized definition of open pedagogy as well as some specifics on how it could be implemented, but always made sure to characterize it as something that could be done in multiple– even conflicting–ways. The team approach has also been really crucial to our pilot. Lots of faculty have really gotten excited about making pedagogical shifts and trying new approaches in their course designs, but this is difficult work. I find that I am being useful in talking through some of the motivations for taking the risks they are contemplating, and the instructional designers and technologists are helping to locate, support, and educate about a variety of open platforms and tools and helping faculty integrate them with our UNH LMS. Combine that with the librarians, who are really doing a lot of work helping faculty find great OER to start with, and faculty have a lot of scaffolds in place to help them succeed as they move into new territory. Q: In your post you asked “If our educational materials are no longer sacred texts which students must memorize in order to achieve mastery, but instead flexible texts that we can critique, modify, augment, and revise, how can our courses capitalize on this, and extend this student empowerment to other facets of our courses?” I am wondering what participants in your group suggested as you asked this question- were there insights? ideas? thoughts? next steps? Sarah Prescott, Associate Professor of Chemistry, is also working to “open” her course by having students create the final section of her syllabus based on their own course goals, and she is also augmenting prior work with self-graded portfolios and a Wikipedia project. In particular, she is thinking about how the Wikipedia project can engage and involve students even after the course itself has ended, to promote lifelong learning and true investment in the material. Catherine Moran, Senior Lecturer in Sociology, is going to ask students to create their own problem sets and exam questions, and she is also thinking seriously about writing her own OER statistics text using worksheets and illustrative problems that she has created over the years. In this way, both Catherine and her students will be contributing to learning materials, not just absorbing or “using” them. Several faculty in our pilot are replacing the LMS discussion boards with public blogs; many have developed innovative Twitter assignments that ask students to follow accounts, tweet, and curate (mostly through Storify) their Twitter activity; and many are thinking about how their current assignments such as screencasts or lab assignments, can be completed, openly licensed, and shared by students to promote scholarly dialogue and to contribute to the body of OER available to learners around the world. Most were very captivated by the idea of the “non-disposable assignment,” and are working to think of creative ways that their students’ work can achieve maximum impact and relevance. Q: How are the instructional designers engaged in the pilot programme? Are they also working with the faculty to create open pedagogy? I am curious about this model. A: Our instructional designers, librarians, and staff from the UNH Center for Excellence in Teaching and Learning were all present for the initial open pedagogy trainings and conversations, but the team approach to the pilot clearly asks each Ambassador to provide the leadership on how to move their course to OER. As a result, our designers are primarily there to help faculty realize their visions, and not so much to lead the way. I have been so impressed by the willingness of our technologists to help advise our faculty on a variety of public web tools. UNH is moving to a new LMS this year, so even though everyone is busy, I have sensed a real willingness on the part of our designers to individualize their support based on exactly what each participant is trying to do. This can be a challenge, since there are so many tools available, and many of them are not primarily designed for educators. One technologist worked tirelessly to import a set of foreign language interactive web pages into the LMS, which was where we all decided it worked best in this particular case; another worked with a faculty member to help her find ways to use Canvas to help manage the organization and tracking of her very large epidemiology class while still allowing her to move many assignments into the open blogosphere. I think it’s crucial to have an instructional design team that is agile, flexible, and encouraging…willing to experiment and willing to listen. 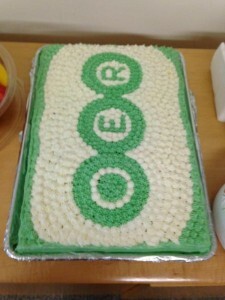 OER cake created for the pilot programme. Rosemary Caron, Professor of Health Management and Policy, sums it up this way, “Since mine is a large class, my Academic Technologists have been great in helping me think through the logistics of these open assignments. My team has helped me to see the possibilities for applying OER and has re-ignited my creativity with my teaching! They are accessible, very willing to help, and experienced – priceless!” By starting with a faculty trainer, letting faculty take the lead on defining their own goals with open pedagogy, supporting our Ambassadors with highly invested instructional designers, and including librarians in key team positions, we try to set our faculty up to succeed with OER and to succeed in revitalizing their courses in ways that will be stimulating for them and for their students. Thank you Robin for such an insightful interview! We wish you and the OER Ambassadors at UNH the best as they you continue your OER-venture!